The Associated Builders & Contractors of Southeast Texas is proud to offer NCCER Contren Learning Series craft training programs for the construction and maintenance industry. For more than a decade the NCCER Contren Learning Series has been the proven performer in craft training for industry. And now, NCCER Contren Learning Series offers even more training built on recognized industry standards and a formal system of recognition for trainees and instructors. The ABC-Southeast Texas Construction Training Center offers regularly scheduled craft training classes in: Welding, Pipefitting, Electrical, Instrumentation, Scaffold Building, Industrial Carpentry, Core, and Construction Site Safety Technician (including OSHA 30-Hr. Cert.). 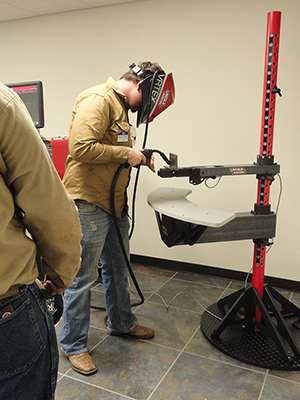 In addition to our 88 Welding Booths, the Training Center has also purchased two Lincoln Welding Simulators. This technology is not only a great asset to our Welding program, but is an invaluable learning tool for our students and instructors. For more information on how to reserve practice time on the simulators, please contact: Horace Brown, Director of Education (ext.106), or via email: hbrown@abcsetx.org. The Training Center’s normal training operating hours are from 6:00 P.M. to 9:00 P.M., Monday through Thursday, during the semester (reference Class Calendar for semester dates). Class tuition for these regularly scheduled classes range from $50.00 to $150.00 per semester, depending on the craft chosen. Click to download a student application or call (409)-724-7886 for more information.